Current President of Gold Country Bonsai Club. I know a lot of us are spending our days in the air conditioned comfort of our offices and homes. Some are out and about (I am one of those) and find various ways to suffer through the days. I use lots of cool water and ice, and try to plan my work so I move from shady place to shady place. Watch out for beetles and caterpillars because hot weather really makes them active. What you will see is that the leaves of your bonsai are skeleton-ized so that all that remains are the veins without any of the green leaf tissue. This can happen quite quickly so be alert. If you see any of this, or aphids, wooly and otherwise, wash them off of the tree first and then wait until dusk and treat with insecticidal soap or very dilute Neem oil. We began defoliation of our maples about 7 weeks ago and now we have a whole new crop of nice tiny bright green leaves. Don’t forget our first annual bonsai show coming up this September 19th at the Rainbow Orchards in Camino. We are going to have room for about 20 bonsai with accents. I will show 2 or 3 of mine depending on how many other good bonsai we get for our display. You are welcome to drop your bonsai off here at the nursery and we will take them to Camino or you can simply bring them to Rainbow Orchards by 7am Saturday morning 9/19. Make sure your trees are really nice and clean. Sign up by emailing me; just give me the name and size of your tree. We will set up the tables with pipe and drape at Rainbow on Friday evening 9/18 at about 5:30pm and then get there at about 7am Saturday morning to arrange the bonsai for the show. The plan is to run from 8am-4pm on Saturday with two demonstrations (one at 10am and one at 2pm) I will do one of them. We need to have docents to help explain to visitors what they are looking at and watch the bonsai. We will dismantle the display by about 5pm and take our stuff home. Scott’s Tips and Techniques for June can be found in his President’s letter above. For additional information on what can be done this month see Peter Tea’s June Write-Up found on the left side of the webpage. Gold Country Bonsai Club: The first Bonsai show by this new club will be held at Rainbow Orchards in the lovely Apple Hill destination at El Dorado County. 10 AM – 4 PM with Bonsai Clinic and suiseki exhibit. For more information, contact Scott Chadd at (530) 622-9681 or scottchadd@lotusbonsai.com. San Mateo Bonsai Club: 52nd Annual Bonsai Exhibit at San Mateo Gardeners Hall, 503 E. 5th Ave. (5th & Claremont). Show hours are 10 AM – 4 PM with Bonsai Clinic to be held by club members. Free Admission. For more information, contact Sam Tachibana(650) 548-9470 or stachibana@sbcglobal.net. Kofu Bonsai Kai: 2015 Bonsai Fest at the Bowers Museum “The Bonsai Tradition: Cultural Arts of Japan” – John M. Lee Court, 2002 N. Main St. Hours are 10 AM – 4 PM daily. Featuring bonsai trees of the members of Kofu Bonsai Kai and special presentations by noted speakers (names, dates and times to be announced). Free to Bowers Museum members or with paid museum admission. Final speaker and presentation schedules will be posted on the Bowers Museum Website: http://www.bowers.org/ and Kofu Bonsai Kai: http://www.kofukai.org/. Questions? Call the museum at (714) 567-3695 or email Michael Walsh at michaeljwalsh@outlook.com. The Artisans Cup held at The Portland Art Museum. The Artisans Cup is the premier exhibition of American Bonsai. The event will also feature select artisans who are creating distinctive supporting elements such as ceramics, woodwork, tools, and more. For further information, visit our website at http://www.theartisanscup.com/. Sierra Bonsai Club: Club show in conjunction with Placer Buddhist Church’s Annual Fall Food Festival. Hours are 11 AM – 4 PM Saturday and 11 AM to 4 PM Sunday. Bonsai demonstration by Scott Chadd in the afternoon, both days. For more information contact Robin Knittle at robin_knittle@yahoo.com or Gary Judd at juddbonsai@att.net or 916-622-8048. Conejo Valley Bonsai Society: 12th Annual Bonsai Exhibition at the Resource Center at the Gardens of the World, 2001 Thousand Oak Blvd. Hours are 9 AM – 4 PM both days with demonstrations at 11 AM (Saturday) and 2 PM (Sunday) in the Bandstand. Free Admission. For information, call Marj Branson at 805-373-1330 or visit our web site at www.cvbs-bonsai.org. East Bay Bonsai Society: 54nd Annual Fall Show at the Garden Center at Lake Merritt Park, 666 Bellevue Ave. Hours areSaturday 10 AM – 5 PM and Sunday 11 AM – 4 PM. Ryan Nichols, a bonsai professional, will be conducting a demonstration on Sunday afternoon. Trees, pots, and accessories for sale. All events free to general public. All day parking $5.00 on Bellevue Avenue and GSBF Northern Bonsai Collection is next door to the show. Yamato Bonsai Kai: 44th Annual Bonsai Exhibition at the Southern Alameda County Buddhist Church, 32975 Alvarado-Niles Rd. Hours are Saturday Noon to 6 PM and Sunday 10 AM to 5 PM. Demonstrations each day at 2 PM by Johnny Uchida, with Mike Baker and Tony Hayworth. Benefit raffle each day after the demo. Raffle includes the demo tree. Large Vendor and Plant Sales area. Free Admission & Parking. For additional information, call Tony Hayworth at 510-289-5731 or visit our web site at www.yamatobonsai.org. Capital City Bonsai Association: 15th Annual Show supporting GSBF Bonsai Garden at Lake Merritt and Sacramento bonsai clubs. Shepard Garden Center in McKinley Park, 3330 McKinley Blvd. Hours are 10 AM – 5 PM Saturday and 10 AM – 4 PM Sunday, with demonstration both days at 1:30 PM by sponsor clubs with bonsai benefit drawings to follow. Vendor and club sales throughout the show. For more information contact Gary Judd at 916-622-8048 orjuddbonsai@att.net . Golden State Bonsai Federation (GSBF): presents 2015 Convention 38 “Bonsai Fusion: Where Tradition Meets Innovation” at the Riverside Convention Center, 3637 Fifth Street near Main. Headliners: Bjorn Bjorholm and John Wang. Guest artists: David Nguy and Tak Shimazu. Demonstrations, seminars, critiques, work-shops, benefit drawings, vendors, and much more. More information available at www.GSBF2015.com. August- Club Picnic has been cancelled. September- Club Show September 19, 2015. The meeting will be a critique of the show which will be held the week before. NOTE: We will again be meeting at the Cameron Park Community Center. October-Since the GSBF Convention will be held on October 29th, we will have our regular meeting on our schedule, October 22nd. We will be working on members trees in preparation for fall and winter. November-Our regular meeting falls on Thanksgiving so there will be no meeting this month. December-Our Annual Christmas Party will be held this month, date, time and place to be decided. Now is a good time to defoliate our deciduous trees. We usually remove all of the leaves. If there are several that have new leaf buds emerging we leave those. The bonsai will bud back really fast this time of year. You will most probably see new growth within about 20 days. As the new leaves emerge in early August they will be smaller than the ones you removed. If you are using scissors cut the sepal about 1/3 between the twig and the leaf. As this piece dies back the new buds will emerge and then the sepal will fall off. You can perform this process on maples, elms, zelkova, crabapples, ginkgos, and other deciduous trees. When you defoliate you can also apply wire and remove some branches that don’t fit with your design. After defoliation don’t give them too much water. Because the leaves are gone the trees will take longer to get dry. In August you can begin feeding with 0-10-10 once every two weeks until the leaves turn color and begin to fall. You can also water your trees using Superthrive or B-1 anytime. It is a good practice to do this every 2 or 3 weeks. Make sure you use a dilute mixture like 1/4 cup for 2 gallons for B-1 or 2 drops of Superthrive for 1 gallon of water. I know it does not seem like very much but your bonsai will notice. Application of fertilizer should continue until mid August and then stop until the end of September. We do this because our trees enter a false dormancy during the really hot months so they will not be able to metabolize Nitrogen, Potassium, and Phosphorous very efficiently. Using fertilizer is an individual thing; you know how your trees are growing better than anyone else so it is ok to listen to lots of advice; but in the final analysis do what you think is best. The August meeting will be our annual picnic for all currently registered club members and their significant others . It will be a pot luck with the club supplying the meat and members supplying the sides. As in the past it will be an R.S.V.P. event so we will have a count of how many will be attending. I will be posting more information after August 1st. San Francisco Suiseki Kai: 34th Annual Suiseki Exhibit at the Union Bank Community Room, Japan Center, 1675 Post Street. Hours are 10 AM – 5 PM. both days. Show coincides with the 42nd annual Nihonmachi Street Fair, so come early and enjoy your day in San Francisco’s historic Japan Town! Suiseki and stone sales. For more information about our club, contact sfsuisekikai@gmail.com or visit http://sfsuisekikai.wordpress.com. July- The meeting will be held at Lotus Bonsai Nursery. Bring trees you would like to work on or have questions about. August- Club Picnic held at Paul Vandlik’s residence. For many of us in the Bay area, June is the time to De-candle our Japanese Red/Black Pines. For others living in warmer climates such as Sacramento or Fresno, de-candling may starts in July. So why the difference? the size of our tree and age will determine if we de-candle early in the month or later in the month. For those of us that decide to develop Japanese Black Pines to Bonsai, it’s important to know what kind of cuts we can make. There are two types of cutting in Bonsai. 1. Complete removal of un-needed branches for the design of the tree. 2. Cutting back to promote back-budding/division or cutting back to a division. The cutting itself is easy though the where, why and when is the difficult part to learn. Don’t be intimidated though and go for it! That’s part of the experience creating Bonsai. Gaining more experience cutting will fine tune your skills so that you know you’re cutting enough and not over cutting at the same time. Is that the only way we can cut the tree? For de-candling, is the Summer the only time we can cut the candles? What if I cut into the middle of a currently growing candle? What if I cut the new candles off at different times of the year? …and can I only work with the new candles? Don’t forget about the needles bud! At each set of needles, there is ONE needle bud there. We don’t normally see them unless they start to grow. If you cut into the needle bud area of the candle, the needle buds closest to the cut point will start to grow. Just know that they take longer to grown then the terminal buds. That’s why when working on young or developing Black Pines, we don’t focus on pulling needles. Removing needles means we are reducing the potential of branch development on a larger percentage of the tree. Once the needles are gone, the needle bud goes with it. The terminal bud is the big bud at the end of the branch. This area can have multiple buds depending on the strength of the tree and the individual branch. Normally when we de-candle, we are cutting back to the previous year’s terminal end. we’re too focused on Black Pine schedules that were meant for refined trees. The Standard Model is correct and useful, but incomplete in learning how to develop Japanese Black Pines from unrefined to refined Bonsai. During the workshop, I will illustrate how we could and should deviate from the standard model (depending on the tree’s situation) to develop Japanese Black Pines from unrefined to refined Bonsai. When we work on your trees, we can then apply those techniques together to further our understanding of the tree’s reactions and the process of developing it into Bonsai. High mountain pines, but when I see the tree, they are always weak and not doing well. person how this is done and if it can be applied to your tree. sure it’s firmly planted in the pot and not moving around too much. If the tree starts to rock back and forth during the work, it’s just extra stress on the tree. May is here and it’s time to get busy. Many of our Deciduous and Broad leaf evergreen leaves have hardened off and it’s time to work on them. Throughout the late Spring, Summer and early Fall is when the majority of deciduous trees are worked on. Unlike conifers where we work on them for a day and sit them on a bench for several months, deciduous trees require much more of our attention (because they grow faster). The time working on them tends to be short but the interval of work is often. Example 1: We defoliate, cut and wire a Trident Maple this month. Within a month, the wire will start to bite into the branch and need to be removed though the new leaves haven’t hardened off yet. After wire removal we put the tree back on the bench. Two weeks later, the new leaves hardened off and the branches are extending. Now it’s time to potentially wire new branches, cut back new grow and defoliate the tree again. We do what we need to do and put the tree back on the bench. The above cycle can happen as many as 1-3 times during the growing season. We can imagine what happens if we miss the required work. The wire can cut too deep into the branch and cause bad scaring or swelling, or the growth can become too thick that we can’t wire the branch anymore, or the tree looses interior branches because we didn’t cut the tree back in time. If any of these things happen, it will cause us to loose time because we would have to re-develop the faulty branches. It’s important to understand that if you’re working with Bonsai that grows fast, they require a lot more of our time (which can be more difficult) whereas Bonsai that grows at a slower rate takes up less of our time (which can be easier to develop). The benefits of a fast growing tree is that you can potentially develop the tree quickly into Bonsai whereas slower growing trees tend to take much longer to develop into Bonsai. 1. slows the tree down. 2. allows light into the tree. 3. new leaves will come out smaller. 4. allows for ease of wiring. Example: We want a branches to grow out and get stronger. We don’t defoliate that branch. because it will slow the growth down. During this month, we can work on deciduous and broad leaf evergreens. We can also work on Junipers, Cypress, and Cryptomeria as well. Work includes, wiring, cutting and styling. Certain trees may be ready for defoliation. For High mountain pines such as Japanese White Pine, Ponderosa, lodgepole, etc, wait till the new needles have hardened off before working on them. For most of us, that time will be about September. We can start working on cedars and spruce after June. There is a lot of information in your yard that you can learn from. It’s just a matter of recognizing that the information is there and your ability to see it and process it. Though we work on many trees during the workshop, the practice doesn’t end there. It’s important to take what we learn at the workshop and apply it to some of our other trees at home. That’s when it’s really going to count because now you’re forcing yourself to make all the decisions. I know it’s difficult at first but with practice and persistence, it will get easier. Once you finish the work at home, please bring it to the workshop so we can review the work and talk about any adjustments we may make to improve the Bonsai. This practice will significantly increase your confidence and make you a better Bonsai Artist. better at Bonsai, not to put you down. That’s not what I’m here for, so don’t worry about showing me mistakes you may have made. We’ll work through it and come up with a plan together. I’m not just looking for mistakes but improvements as well. 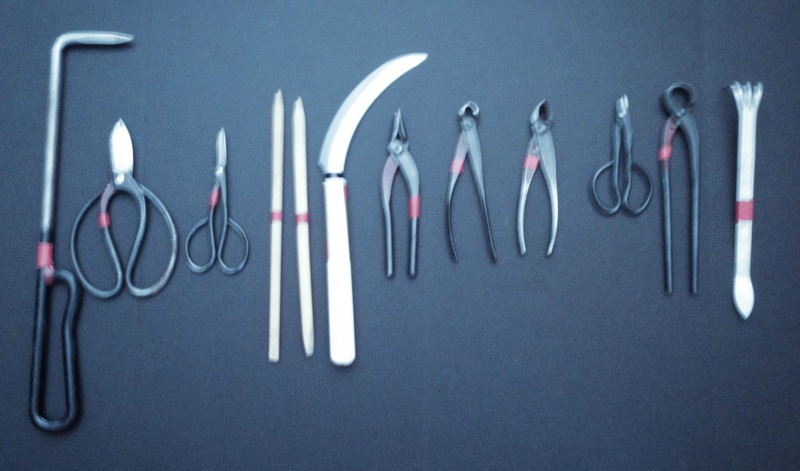 I can’t emphasize enough that it’s crucial to have the right tools and supplies for the job. This will allow us to focus more on proper development of the Bonsai. Not having the tools or supplies needed only slows us down. If you’re not sure what tools or supplies you need, reach out to other workshop members or myself and we can talk about what to get. Many of your fellow study group members have no problems letting you borrow their tools or materials but after awhile it can wear them down so it’s time to just get your own. If you plan on wiring deciduous trees, please bring your aluminum wire set with you. This includes sizes: 1.0mm, 1.5mm, 2.0mm, 2.5mm, 3.0mm and maybe 3.5mm. If you don’t have these sizes, find a vendor that can sell you some or contact me and I’ll see what I can get for you. Because our weather has been quite warm and dry, and some days have strong winds the “old routine” for care of our bonsai must change. Be sure that you don’t let the trees dry out on the days when there is wind. Look carefully for spittle bugs, aphids, scale and powdery mildew as these are all very active now. For spittle bugs and aphids the best cure is to wash them off with a sharp stream of water from your hose. For serious or malignant infestations mix one (1) tbs. of liquid hand soap and two (2) tbs. of rubbing alcohol into 2 gallons of water and use this as a spray. Apply in the evening when the sun is low and not shining on your bonsai. In a day or two you should see results; if not wait five days and re apply. For scale mechanical removal is best. Use your fingers, a tooth brush or some stiff bristled plastic brush and smash them and then wash them off. Scale insects are difficult to detect and they multiply and spread quickly so be alert for shiny black, brown, or black with white spots round objects on your tree. They can vary in size from about as big as a BB on up to as big as a pencil eraser or larger. These are bad bugs and will cause a lot of trouble if left alone so stay vigilant. Powdery Mildew is just part of growing plants. It is carried on the wind and cannot be stopped. To slow its progress a good dormant spray (at least 2-3 times) applied in December/January can help. Once it appears it tends to respond pretty well to standard garden sprays for fungus and some will even say powdery mildew on the label. Make sure you follow the directions and dilute the mixture by 40%-50% prior to application. It is also a good idea to remove the affected leaves, they are ugly and contagious, and throw them in the garbage can. Try to protect Lady Bugs and Praying Mantis as they are very helpful with insect problems. I will not begin fertilizer on newly repotted materials for another month although we have been applying liquid fertilizer to established plants for about the last 5 weeks. We use Miracle Grow and also More Bloom and apply per the directions once a week in the morning before the sun hits the trees. If we miss our chance in the AM we wait until early evening 7-8pm and apply it then. This is a reminder that we have a new meeting place and time for our for our monthly meetings: Cameron Park Community Center 2502 Country Club Drive Cameron Park, CA. 95682 Classroom B, from 7:00 to 9:00pm, on the 4th Thursday of each month. We are responsible for clean up after our meetings so if you can bring a cloth to cover the table you will be working on and a broom and dustpan if you have one. Scott’s Tips and Techniques for April can be found in his President’s letter above. For additional information on what can be done this month see Peter Tea’s April Write-Up found on the left side of the webpage. April 18, 2015 (Saturday) Napa Valley Bonsai Club: Annual Show at the Napa Senior Center, 1500 Jefferson St. Show hours: 11 AM – 4 PM with demonstrations at 1 PM with Jonas Dupuich. Vendors, silent auction and raffle of demo tree. Huge outdoor sales area with trees, pots, and bonsai related items. For more information please visit www.nvbonsai.org. April 18 – 19, 2015 (Saturday & Sunday) Modesto Bonsai Club: 34th Annual Spring Show and Exhibit, Park Inn by Radisson, 1720 Sisk Rd. Show hours areSaturday 11 AM – 5 PM and Sunday 11 AM – 4 PM with demonstration by Sam Adina at 2 PM both days. Free admission. Exhibit, Raffle, Beginner workshops and more!! Sales of plants, pots and other bonsai items both days (with auction immediately following demo). For more information contact Peter Camarena at (209) 529-1759. April 25 – 26, 2015 (Saturday & Sunday) San Diego Bonsai Club Celebrates it’s 50th Year with a Spring Show at Casa Del Prado, Room 101, Balboa Park, San Diego, CA. Free admission. Show hours are 10:00am – %:00pm with demonstrations at 11:00am and 1:00pm both days. Bonsai trees, plant material as well as other Bonsai related items for sale. For more information visit: http://www.sandiegobonsaiclub.com or contact Janice Hale via the website. April 25 – 26, 2015 (Saturday & Sunday) Bonsai Sekiyu Kai: Annual show will be held at the Sacramento Buddhist Church, 2401 Riverside Blvd. Hours are:Saturday Noon – 5 PM and Sunday 10 AM – 4 PM. Demonstration 2 PM both days by Yuzo Maruyama. Amenities include refreshments, light snacks, door prizes, raffles and a silent auction. Member and vendor sales of plants and bonsai-related items will also be available. For more information contact Doug Hamby at (916) 273-2328 or doughamby@gmail.com. May 2, 2015 (Saturday) Conjo Valley Bonsai Society, Camarillo, CA. Exhibition at Community Room, Camarillo Library, 4101 Las Posas Road from 10:00am-5:00pm. the exhibition will be supplemented by lectures and demonstrations by club members. May 2 – 3, 2015 (Saturday & Sunday) Kusamura Bonsai Club 55th Annual Show at the Lucie Stern Community Center, 1305 Middlefield Rd., Palo Alto, CA. Show hours are Noon – 5:00pm on Saturday and 11:00am – 5:00pm on Sunday with a demonstration at 1:00pm on both days. Club members sales a available. For more information contact Mark O’Brien at (650) 327-0450 or mobrientrees@hotmail.com. The club’s website: http://www.kusamurabonsai.org also has more details. May 2 – 3, 2015 (Saturday & Sunday) Amador Bonsai Society: 14th Annual Bonsai Show held in conjunction with Sierra Madre Garden Club’s and Mother Lode Rose Society’s Flower Show and Exhibition, “Springtime in the Foothills” at the Amador County Senior Center, 229 New York Ranch Rd. Free admission. Hours are 11 AM to 4 PM. “My First Bonsai” classes will be held both days. Hourly raffles. For more information visit www.amadorbonsaisociety.com or contact Juliene Hiatt atjulienehiatt@hotmail.com. May 2-3, 2015 (Saturday & Sunday) Dai Ichi Bonsai Kai, Gardena, CA. : Annual Exhibit “Serenity through Bonsai” at the Ken Nakaoka Community Center, 1670 W. 162nd St. Hours are 10:00am-4pm, both days. Novice to master bonsai exhibits. The club will sponsor a beginner’s hands on workshop at 10:30am Saturday followed by a 1:00pm round robin demonstration with Mel Ikeda and friends. Sunday at 1:00pm will feature a Saikei demonstration by Mr. Frank goya. Demonstration items will be in the benefit drawing, which follows each demonstration. For more details about our club and show visit: http://daiichibonsaisaikai.wordpress.com. May 22 – 23, 2015 (Friday & Saturday) Lotus Bonsai Nursery’s 9th Annual Spring Sale. Hours are 9:00am to 4:00pm both days. This is the not to be missed once a year only sale at the nursery. Up to 20% off on all Bonsai, stock plants and pots. For more information contact Bolet at: bolet@lotusbonsai.com. June 13 – 14 (Saturday & Sunday) Descanso Bonsai Society 46th Annual Bonsai Show will be held at Descanso Gardens, 1418 Descanso Dr., La Canada, CA. Show hours are 9:00am – 4:00pm with demonstrations at 11:00am and 1:30pm both days. The indoor show will be held in Van De Kamp Hall. Trees form Novice to master exhibitors will be on display. A large selection of bonsai trees, pots, bonsai stock and accessories will be for sale. All events are free with garden admission. For more information visit our website at: http://www.descanso-bonsai.com. June 13-14, 2015 (Saturday & Sunday) California Suiseki Society, Oakland, CA. : 20th Annual Show at Lakeside Garden Center on Lake Merritt, 666 Belleview Ave. Free admission. Hours 10:00am-4:00pm. Featuring our best stones collected from California sites over the last two decades under our late beloved sensei, Felix Rivera. The sales area will feature Suiseki books and magazines (many out of print) as well as Suiseki and Viewing Stones from members collections. For more information, contact Henry van der Voort at oldboar3@gmail.com or Bob Gould at rgould@aol.com. September 25-27, 2015 (Friday, Saturday, Sunday) Portland, OR. The Artisans Cup held at The Portland Art Museum. The Artisans Cup is the premier exhibition of American Bonsai. The event will also feature select artisans who are creating distinctive supporting elements such as ceramics, woodwork, tools and more. For more information, visit our website at http://theartisianscup.com/. September 26-27, 2015 (Saturday, Sunday) Sierra Bonsai Club, Penryn, CA. Club show in conjunction with Placer Buddhist Church’s Annual Fall Food Festival. Hours are 11:00am-4pm both days. Bonsai demonstration both days by Scott Chadd in the afternoon. For more information contact robin Knittle at robin_knittle@yahoo.com or Gary Judd at juddbonsai@att.net or (916) 622-8048. October 3-4, 2015 (Saturday & Sunday) Conjo Valley Bonsai Society, Thousand Oaks, CA. 12th Annual Bonsai Exhibition at the Resource Center at the Gardens of the World, 2001 Thousand Oaks Blvd. Hours are 9:00am-4pm both days with demonstrations at 1:00am Saturday and 2:00pm sunday in the bandstand. Free Admission. For information, call Marj Branson at (805) 373-1330 or visit our website at http://www.cvbs-bonsai.org. October 24-25, 2015 (Saturday & Sunday) Capital City Bonsai Association, Sacramento, CA. 15th Annual Show supporting GSBF Bonsai Garden at Lake Merritt and Sacramento bonsai clubs. Shepard Garden Center in McKinley Park, 3330 McKinley Blvd. Hours are 10:00am-5:00pm Saturday and 10:00am-4:00pm sunday, with demonstration both days at 1:30pm by sponsor clubs with bonsai benefit drawings to follow. Vendor and club sales throughout the show. For more information contact Gary Judd at (916) 622-8048 or juddbonsai@att.net. October 29-Nov. 1, 2015, (Thursday, Friday, Saturday, Sunday) Riverside, CA. Golden State bonsai Federation (GSBF) presents 2015 Convention 38 “Bonsai Fusion: Where Tradition meets Innovation” at the Riverside Convention Center, 3637 Fifth Street near Main. Headliners: Bjorn Bjorholm and John Wang. Guest Artists: David Nguy and Tak Shimazu. Demonstrations, seminars, critiques, workshops benefit drawings, vendors and much more. More infromation available at http://www.GSBF2015.com. April – We will start work on trees for the Club show slated in September. Members will be asked to bring several trees that are candidates for exhibit. May- This month will also be working on show trees. June/July- Meetings will be held at Lotus Bonsai Nursery. These months we will continue work on show trees as well as improving members bonsai. Spring is in full swing and I’m excited to see all of my trees starting to grow again. The Winter hasn’t been very cold and many trees have started growing much earlier this year. Early isn’t too big of an issue because we don’t get sudden hard freezes during the Spring months so our trees continue to grow. Because of this, we can get started working on a trees slightly ahead of schedule. Deciduous– By mid April most of the leaves on our deciduous trees will have hardened off. That’s the perfect time to start working on the trees. We can focus on cutting, wiring and for some, defoliation (only for certain trees). If the leaves haven’t hardened off yet, hold off for a few more week till they do then start working on them. Broadleaf Evergreen– These trees can be worked on this month as well though there may still be some sensitive new growth on the tree. We just have to be careful not to damage the new foliage when working with the tree. I recommend using Aluminum to wire deciduous and broad leaf evergreen. It’s much easier to use and easier on the tree itself since these trees have much thinner bark and live tissue. Conifers– Conifers such as Junipers, Cypress, Cryptomeria, Spruce, and Cedars can be worked on this month. If you have Japanese Black/Red Pines, hold off working on them till June. If you have High mountain pines (any pine that grows in the mountains), allow them to grow through the Summer and start working on them in September. If you had just repotted the tree this Spring, hold off working on them till the Summer. Since Conifer roots grow slower than Deciduous trees, we need to give them more time to fill the pot and re-establish themselves. Now that everything is growing, our Bonsais will need much more water. Watch out for trees that are drying out and be sure to keep them all hydrated. Having Bonsais dry out too much during the Spring will weaken the tree and cause problems in the foliage’s ability to grow well or handle the Summer heat. For those that aren’t sure about when to fertilize, here is a simple timetable you can use to make it easy. Since we all use different fertilizers and our soil components aren’t the same, I can’t tell you how much to feed but rather when to feed. It’s up to you to observe how your tree is growing and if it’s growing the way you want it to grow. This timetable is for trees that are in branch development mode. Do not use this timetable for trunk growth or sick trees. They fall into a different schedule. We will go more into the, “why?” details of the schedule during the workshop. One of the major issues people have while learning and practicing Bonsai is developing consistency in their work. If we don’t become consistent in Bonsai horticulture and styling, it’s makes refining Bonsai harder, causing us to cap the potential of the Bonsai. Since we’re trying to guide our Bonsai to grow and look a very specific way, we have to be consistent with the work so we can get predictable results allowing us to push our developmental and refinement process even further. Sun– The Sun is so important for life on Earth. Sunlight is a key component to photosynthesis and how our trees create most if its food. We have to understand how much Sunlight our individual trees need and provide that for them. If we provide them with too little light, then the trees would tend to grow leggy and weaken. In some cases, the tree may even die off. On the other hand, if too much sunlight is provided, trees can burn and loose branches or even die all together. Take the time and observe how your trees are doing in the sunlight you are giving them and make any necessary adjustments. If your backyard has too much sun or too little sun, it may force you to work on specific types of species only. Water– It’s important to understand what our individual water quality is like. Hard water causes a build up of salts in the soil and turns the soil alkaline which most trees dislike. Deciduous trees have a much harder time growing in alkaline conditions whereas conifers then to tolerate it more. For example, unless I run my tap water through an Reverse Osmosis filter, my deciduous trees grows very poorly. How we water also plays a role in the tree’s growth. Depending on the soil’s ability to hold water, over watering or under watering will cause trees to slow down or weaken. Be sure to water when the tree needs it. If you’re watering and you notice your trees are still wet from the last watering, hold off and wait for it to dry out a little bit more. Keep fine tuning your watering schedule till you find a good compromise between what the tree needs and your personal schedule. Soil– If you’ve repotted with me before, you know that soil is a very important part of Bonsai. What type of soil we use and how much water it holds will cause our trees to grow very differently. Drier soil mixes causes the tree to grow faster whereas wetter mixes causes the trees to grow slower. Repotting interval also causes the trees to grow differently as well. Deciduous trees grow slow when repotted often whereas Conifers grow faster when repotted often. Fertilizing– It doesn’t get easier then this. Fertilizing is a great way of giving our trees that little extra push to grow more. But again, be sure that you’re not causing the trees to grow in a manner that’s not inline with your goals for the tree. Fertilizing is good but sometimes over doing it can cause more problems, such as burning of the roots (more likely with Chemical fertilizers) or excessive un-needed growth. Styling– This the fun part in Bonsai and why most of us got into the Art in the first place. Styling includes cutting and wiring techniques. We tend to jump to this before we cover the above 4 categories first. This category is very involving and takes a good amount of time and practice, which is why we take workshops together. As always I look forward to working with you all. See you at the workshop! March 2015 Gold Country Bonsai Club Newsletter. We will be working on evaluation and styling our bonsai at this month’s meeting. Bring your bonsai for advise and improvement. Also it is important to bring a bonsai for ‘show and tell’ especially those at are now flowering, e.g., quince, pear. Bolet and I recently visited a couple of wonderful bonsai gardens. One of them, the “Clark Collection at the Shinzen Friendship Garden in Woodward Park” is just now begin built. The “Bonsai Garden at Lake Merritt” (BGLM) in Oakland was established in 1999 and is one of the premier bonsai collection on the west coast. Our first stop was Woodward Park in Fresno. It is a large park, several hundred acres and the Shinzen Friendship Garden is on about 5-10 acres within the larger park. The garden is a partnership between the city of Fresno and its sister city in Japan and is about 25 years old. 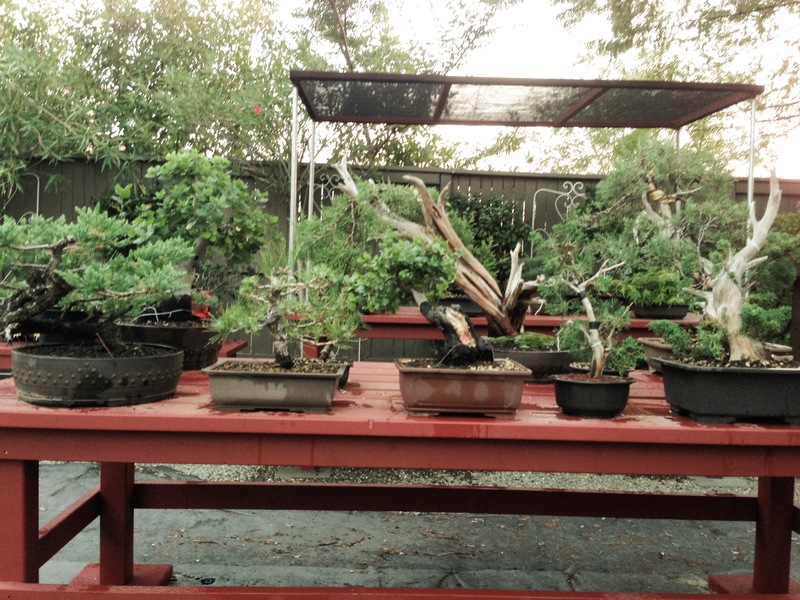 The Clark Center bonsai collection which has been located in Hanford, Ca. for the last 14 years has been the home to a regionally significant bonsai collection. The Clark Center is closing so we have been on the hunt for a new home for the collection which consists of about 80-100 very beautiful bonsai. The Shinzen Garden and the Golden State Bonsai Federation entered into an agreement to construct and manage a “stroll garden” to display the Clark Collection inside the Shinzen Garden. The bonsai display area is currently under construction with a ‘soft opening’ scheduled for July/August of this year. On Saturday 2/21 we attended the board of directors meeting at the BGLM. This is the most successful of the partnerships between the GSBF and bonsai gardens. In 2014 they had a total of 5500 hours of volunteers work spread out between 473 different people who worked in the garden. If you have not had a chance to visit please make arrangements to go. It might also be a great opportunity for the club to take a field trip. You can still re-pot in March. You can still re-pot junipers and pines, but if your deciduous have leafed out I would hold off until the leaves have hardened off. If you have re-potted all your trees March is a good time to cut back and wire your conifers. Be careful when wiring to not disturb the new growth. Some of them can be very soft and easily break off. Broad Leaf Evergreens (any type of leafy evergreen) can be pruned and wired this month. One last note, keep an eye on how much water your trees are consuming. As the temperature warms up your trees will require more water as the soil will dry out faster than during winter months. March 28 – 29, 2015 (Saturday – Sunday) San Jose Betsuin Bonsai Club 45th Annual Bonsai Exhibition at San Jose Buddhist Church Betsuin, 640 North Fifth Street, San Jose, CA. Hours are Noon – 5:00pm Saturday and 11:00am – 4:00pm Sunday with demonstrations at 1:00pm both days by club members headed by Dr. Seiji Shiba. A benefit drawing wil be held at each demo conclusion. Styled and pre-bonsai trees will be offered for sale. For more information, visit: http://www.gsbf.org/sjbonsai or email Ken Azuma at: kennetazuma@sbglobal.net. April 11 – 12, 2015 (Saturday & Sunday) American Bonsai Association, Sacramento: Annual Spring Show at the Shepard Garden and Arts Center in McKinley Park, 3330 McKinley Blvd. Hours: Saturday 10 AM – 5 PM, and Sunday 10 AM – 4 PM with demonstrations by Dan Robinson, ‘The Picasso of Bonsai’, at 1:30 PM both days; and a Beginner workshop Sunday morning, with sign up Saturday & Sunday before 10 AM (cost $10.00 with trees, wire, etc., provided). Large member and vendor sales area, silent auction of quality bonsai accessories. Benefit drawing on Saturday and Sunday includes bonsai, bonsai related items, and demonstration trees. Great opportunity to obtain quality bonsai, pre-bonsai, pots, and supplies.